I’ve been spending most of my days the past few weeks half working on grad school apps and half going to the protest sites, mostly at Admiralty, Causeway Bay, and Mong Kok. Now that I’m done (for the most part) with writing, I can get back to the blogging! I’ve been taking photos everywhere I go as a way to remember where I am and what I’m doing, as well as to keep a record of all the amazing art and assembly at the demonstrations – it’s been absolutely amazing to see the changes happen over time. I’m also going to be relying a lot on SCMP’s daily updates to help jog my memory and keep the days and nights straight. There – full disclosure on my sources. I’ve also decided to call this movement by it’s more common, beloved name: The Umbrella Movement. 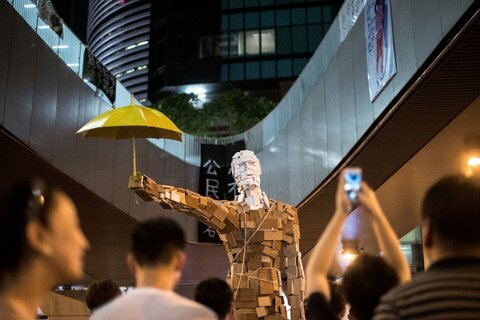 Please note (and I mix this up in conversation too, sometimes) that it’s not the Umbrella Revolution – the goal is not to overthrow the government (Hong Kong or Beijing), and neither is it to declare independence from Beijing. It’s a Movement. In a way, that’s what makes it so hard to describe, to contain, to lead, and to put down. It’s amorphous, which is one of the many reasons why I am – I admit – growing more and more fond of it. So on October 4, the day that us Fulbrighters went out to lunch at Mido, there were still fears that there would be more violence. There was a rumor going around that night that the police would be arriving in Admiralty to clear out the protests with rubber bullets – it turned out to be false, but it was still pretty crazy. I was hanging out with the EMs that night, and some were discussing the concern that they especially had to leave before anything broke out. * Because they stand out from the rest of the ethnic Chinese crowd, they thought the police would be able to recognize them and target them specifically. This has really become a common theme in discussions about what kind of role EMs can play in the protests – this fear of police brutality toward EMs. It’s especially strange because I recall talking with a Mexican man who’s lived here for a long time, and he said there wasn’t a problem with police for EMs – that instead, more Chinese were likely to be profiled because of suspicions of illegal immigration from mainland China. Regardless – nothing happened, but tensions were still high. The next day Henry mentioned to me that he’d seen two men and a women with identical sleeve tattoos in Mong Kok, watching the crowd with two muzzled attack dogs. Despite Hong Kong’s famous gangster films, I never really thought it of as being a corrupted, crazy place as depicted – yet the protests have completely changed that impression. 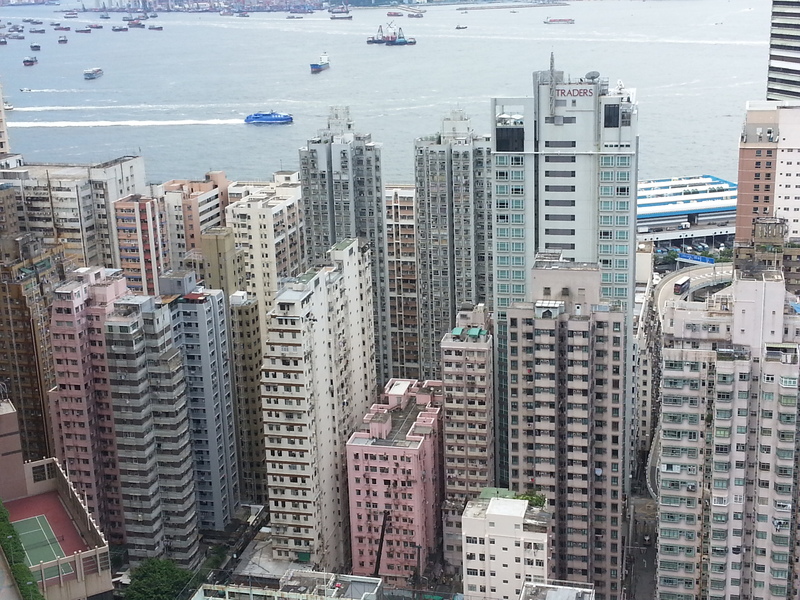 That’s not to say that Hong Kong is now so dangerous, but I’m getting a new perspective on what role gangsters and triads have here. Apparently, one of the reasons why there are so many Hong Kong gangster films is because the triads were involved in the film industry! It was about the night of October 5 that the first statue reminiscent of the Goddess of Democracy was put erected. He’s known as the Umbrella Man – check out the NY Times blog piece on him. Interestingly, the 22-year-old university graduate who built him with his friends says he didn’t think of the association between this statue and the Goddess of Democracy. Ever since the statue’s been set up, news articles everywhere have been drawing correlations between this and the Goddess statue – which, to me, shows both (a) the media’s ability to influence narratives, whether they’re accurate or not, (b) the lack of an artist’s control over their work once it gets put out into the world. I must have spent all of October 6 indoors writing grad apps, only keeping up with the ninth day of the protests purely through the internet. I heard the news about a Tsinghua student who attacked an HKU professor for not teaching in Mandarin – though the official language of instruction at HKU has always been English. Here’s a great post from Coconuts HK with a really detailed Tweet, and the Apple Daily update that I got. The professor went to the hospital and was generally fine – the mainland student was taken away by police, and I haven’t heard updates on him since. I also came across this article by Foreign Policy, in which they discuss a Beijing article and call it an “Anti-Hong Kong Rant.” I can’t read the article now, FP says I’ve exceeded the number of free articles (grr) but from what I recall, I thought the argument actually made a lot of sense up till about halfway through. The next day I continued working on grad apps, only coming out at night to join the EMs at their interview with Pinoy Fuse, a Filipino radio program run out of Cyberport that just launched this March that focuses on the stories of Filipinos born and/or raised in Hong Kong. Its parent is the Digital Broadcasting Corporation. The week before they’d already hosted one discussion with Filipino guests Danilo Reyes, deputy director of the Asian Human Rights Commission, and Theresa Cunanan, a senior lecturer at Hong Kong Baptist University, on the relationship between Filipinos and EMs and the Occupy Central movement. That night they were hosting people from a wider spectrum of ethnic backgrounds, and so they asked Jeffrey to help find other participants. Jeff’s been one of the most publicly visible people in the group; he is one of the first locally-trained social workers for ethnic minorities, and speaks fluent English, Cantonese, and a few other languages. I asked if I could tag along just to sit in and listen to the discussion. They’ve really been getting a ton of media attention – from the BBC to Al Jazeera to Facebook to local stations – and it turned out that in addition to the interview with Pinoy Fuse in English, they had also been asked to interview with a Cantonese station. It took us a while to find the station, and we ended up being quite late, but nevertheless they had a long, good interview. You can listen to the archived interview here. Really, thinking about the relationship of all these “foreigners”to the Umbrella Movement, each with different names, class, and race implications – foreign domestic workers, ethnic minorities, expats – makes this situation so confusing and fascinating. Jan Yumul, the show’s host, asked an especially interesting question: Can you be pro-Beijing and also sympathetic to ethnic minorities [as Hong Kong’s Chief Executive]? I’m not sure how to answer that, but my feeling is that for now, anyway, the CE wouldn’t really care about EMs unless they had money – which some do. I also noticed that Jan asked Ansah, perhaps the only woman who’s been marching with the group every night, what it was like for her to march as a woman and an ethnic minority. She was about to talk when the others jumped in enthusiastically for her, lauding her bravery – and then they had to cut to a song break, and when they returned, Jan moved on to another question. I know she’s since been interviewed by Al Jazeera, but it is curious to think about the gender issues in the Umbrella Movement widely as well. There’s only been a handful of women in leadership positions, and the recent violence in Mong Kok seems to have turned that protest site into a men’s-only kind of rough-and-tumble environment, with only a few women demonstrating. After the show with Pinoy Fuse, we headed upstairs in the same building for the Chinese language interview. Because of space limitations, they could only have two guests, so Ansah and I sat out (both of us also have less strong Cantonese fluency). After the show, the interviewer and the rest of us took a bus out to Causeway Bay, and from there I left the group to go home. Sometime that night, the wall of post-its that’s been growing in Admiralty was christened the Lennon Wall. I also read an interesting first-person perspective by Lijia Zhang in SCMP entitled, “Mainlanders remain cool to Hong Kong’s democracy fever” [link], an article by the New York Times about Hong Kong’s identity as a Chinese city and the reception of the protests by people in Beijing, and came across this video, also by the New York Times. To go with the article on Hong Kong’s identity, here’s a music video by two very famous Hong Kong stars singing the city’s praises. *”EM” or “ethnic minority” is how they often refer to themselves, so despite my own discomfort with the term, it’s how I’ll refer to them as well.